Perfect vacation spot! Cozy, clean, inviting and charming. Kitchen - gas stove, dishwasher, microwave, Keurig, toaster. Bedroom - trundle bed with two singles, a bureau & luggage caddy. You will fall in love with this vacation respite for sure! 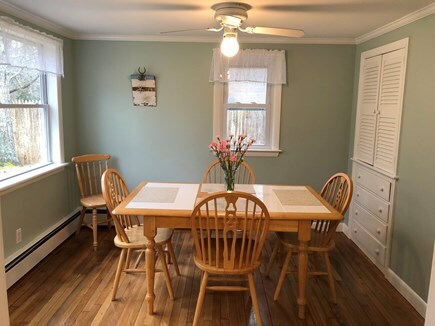 We are so excited to share our home with visitors because every inch of the interior is newly renovated, bright and charming. We are proud of several extra special touches in back yard that will make this the most enjoyable vacation you can imagine. Our goal is to provide you with everything you need to come, stay, relax and play. 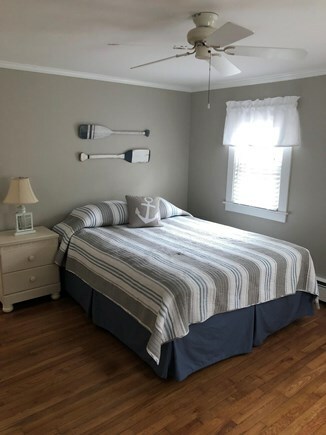 Our home is located on a quiet, dead end street that overlooks Lewis Pond and is only 1.5 miles from Yarmouth's beautiful Sea Gull Beach. Nearby restaurants, shopping and activities are perfect for all ages. 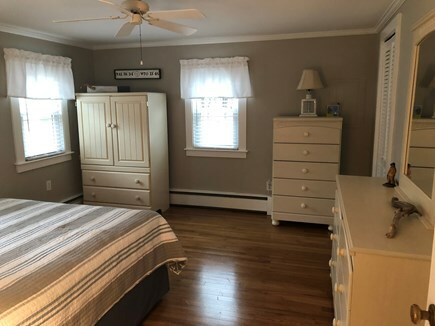 Please read the section in this listing about what is special about this area for more information. Of course, we are also willing to speak with you directly concerning questions you may have about all the Cape has to offer. Once you arrive at our home you will see we have compiled a complete booklet full of attractions, brochures, menus and other information that will be helpful in navigating the vast amount of activities available to you during your stay. 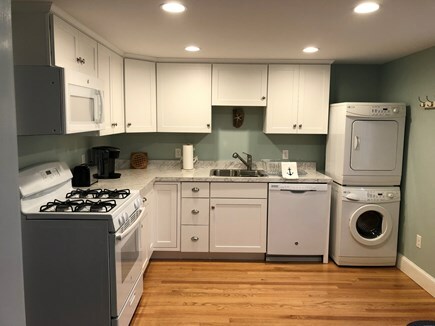 Our newly renovated interior offers a full service kitchen complete with microwave, gas stove, and a dishwasher which is great for cooking at home. Enjoy the large gas grill, outdoor patio set, yard games, outside shower, and fire pit in the spacious, fenced in back yard. Special amenities include beach chairs, sand toys, boogie boards, a cooler and beach umbrella. We even supply a large red wagon perfect to fill up and walk to the beach. 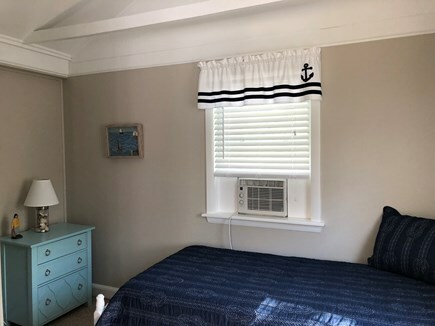 To make your stay more comfortable you will also find air conditioning units in each of the three bedrooms, a washer/dryer, cable TV, and the Internet. Just incase you need them, we have supplied some board games, cards and puzzles to enjoy. Of course, also included are all bed linens as well as plush bath towels and beach towels. Our 3 bedroom home offers a queen bed, a double/full, and 3 twin beds. The master bedroom is spacious enough for a portable crib (not included) to be set up. Our guests are responsible for supplying their own personal toiletries, laundry detergent and food. Additional availability info: 50% deposit & signed lease to reserve. $300 damage dep. due w/ balance. This is a Saturday to Saturday vacation rental. Thanks for taking the time and effort to provide us with such a wonderful vacation cottage. This place has everything we needed and more, a lot of extras that made it even better! Hope to get back there next year! Thank you for your input. It certainly makes us very happy that all the special details supplied were appreciated. You were wonderful guests and we would be so thrilled to have you back next year. Love it ... it was just right for me and my grandkids . We got to use the owners' beach gear, and the beach was only 5 minutes away. We are so glad you " loved it. "Thank you also for the nice note in the guest book that expressed how much you enjoyed your stay in our home. Thank you so much for the review. We are so happy you enjoyed all the extras we tried to build into our home. It is our goal to make it a place that families will want to return to year after year. You were fabulous tenants. We really hope to see you back again! We'll be back next year, for sure! We spent a week at this cottage and it didn’t disappoint! It’s just 1.5 miles to the ocean in a residential area that makes it feel like you’re on a private beach. Chairs and beach towels are available at the house so all you need is your swimsuit. The house is very comfortable and is stocked with everything you need. 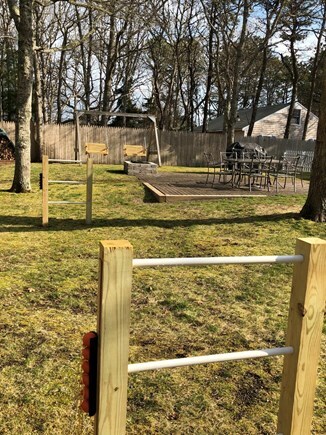 A bonus for us was the huge back yard equipped with a grill, wooden swings and a cool yard golf game. You can’t go wrong renting this house for your vacation! 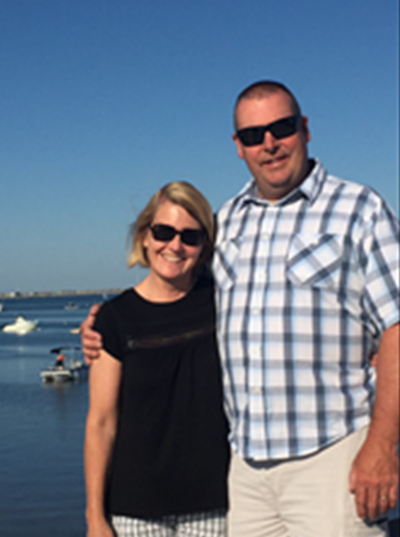 Note from Mike: I grew up on Cape Cod, so I have an idea of good things on the Cape. This cottage is a very, very good one. My wife, mother in law and I stayed here for a week. All slept like logs every night. There’s a third bedroom with bunk beds we didn’t use. 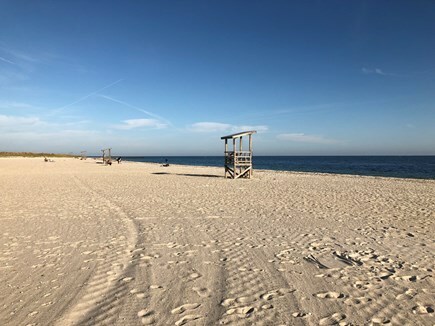 My wife and I walked the 1.5 miles to Sea Gull Beach every day - no need to pay $75 for a week-long beach parking sticker. For me, where we stayed on this vacation was make or break. I ended up having to work a lot. The WiFi was strong and the dining room table big, providing the necessary work space and internet access. When I needed to clear my head, I took the 100 yard stroll to Lewis Pond at the end of the dead-end street. Acres Ave. is peaceful. To my surprise with all that was going on with work, I still came away from vacation more rested than I was coming in. 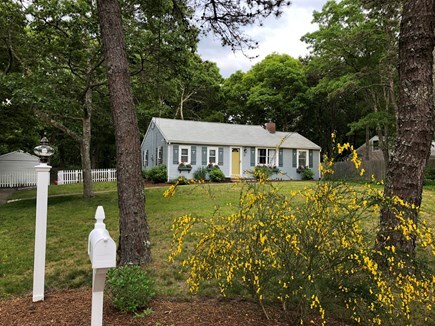 I attribute a lot of it to this classic Cape cottage: big screen TV, coffee maker, a renter’s manual listing all the best restaurants close by! - it really has it all. We even went home with clean laundry, using the washer and drier the night before we left. We give this cottage our highest recommendation. Thank you for taking time to share your feedback! We appreciate your kind words and we are glad you enjoyed all the little “extras” we have stocked the house with. It is our goal to create a very relaxing and comfortable environment for all our guests. We look forward to seeing you again. We have lived in this area for over fifty years and just love it! 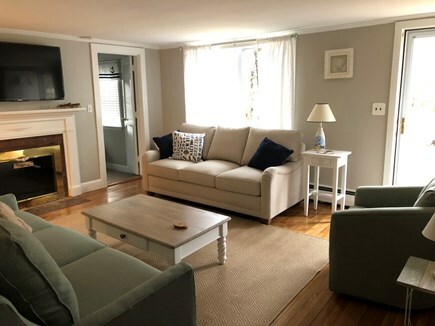 Our rental home is all newly renovated with the goal of making it a perfect vacation spot for all who visit. We are available and more than happy to answer any questions you may have about the area or our home. Or home is so welcoming and we are proud to share it with you. It is very clean, new and bright and we have tried to stock it with everything needed to make you feel at home. All bed linens, bath towels and beach towels are included. The kitchen is complete with a service for 8 as well as cookware, bakeware, and grilling utensils. 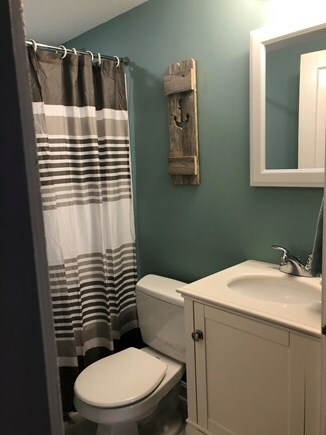 Special touches such as a Keurig Coffee maker, popcorn machine and lobster pot are available with the vacationer in mind. The large back yard is completely fenced in and showcases a patio with an outdoor dining set, fire pit, gas grill and lawn games. You will find everything needed for a great day at the beach including chairs, a cooler, toys, boogie boards and a beach umbrella. Our private outdoor shower is perfect after your day on the beach. Our location is perfect for vacationers with something for everyone and every interest very close by. 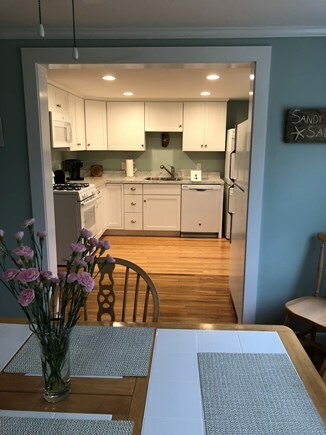 Our home is especially ideal for families because whether it is fabulous restaurants, beautiful beaches, town parks, playgrounds and bike paths or shopping you have in mind it is all available under two miles away. Of course we can't forget the special attractions like the Whydah Pirate Museum, adventure mini golf courses, the Inflatable Park, and Sports World within the same distance. Perhaps a whale watch, a water cruise, a sport fishing trip, parasailing, paddle boarding or kayaking is more for you. Well, its right near by. 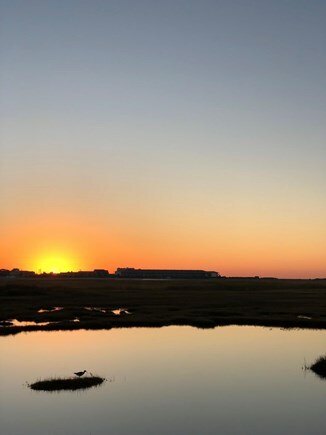 If you are looking to adventure outside of our immediate area you can visit exciting places all the way from the tip of Cape Cod, as you climb the Pilgrim Monument in Provincetown for breath taking views, the pristine National Seashore and Visitors Center, Marconi Station, or even a Lighthouse tour. 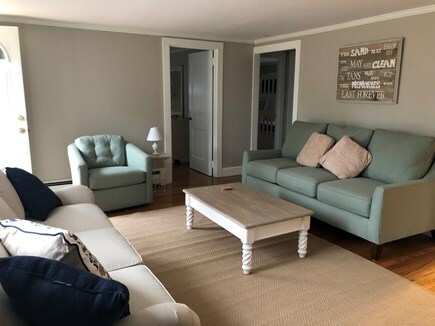 Our home is also less than 4 miles away from the Ferry that will whisk you off to either Nantucket or the Vineyard for a day long adventure. The Hyannis Transportation Center, offering the bus and train system, and the Hyannis Airport is located under 4 miles away as well. With so many things to offer in our area we have compiled a book with detailed information of all of these special places and more and left it in our home for your convenience.